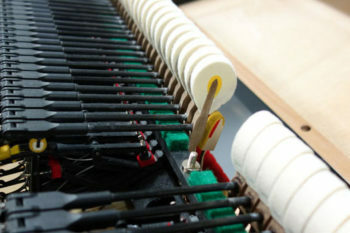 A wippen is the heart and soul of the grand piano action. With some aspects of piano design and construction there is a wealth of variety but not so much anymore with the wippen. The top two wippens in the photo represent the most fundamental designs (yes, you nit pickers there are more, but these two are the most common designs in pianos of the last 30 years or so). The top one is called a Schwander design and was the most common wippen design until about 10 years ago or so. The middle one is called the Herz spring design, or commonly the “Steinway” wippen because it was primarily found in Steinways until about 10 or so years ago. Since that time most manufacturers have migrated to the Herz design because it repeats better. You can get an idea of why it repeats better when you look at where the repetition lever (the angled piece on the top) fulcrum is and the way the spring is attached. In the Herz design the repetition lever fulcrum is closer to the middle and the spring clearly has better positioning to lift or suspend the repetition lever during play. 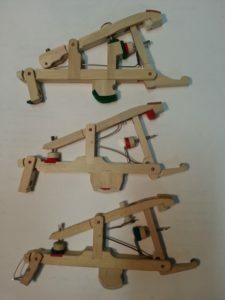 The main complaint about the Herz design is that setting repetition spring tension is much more difficult and time consuming. On the Schwander design you set the tension by turning a screw. On the Herz design you have to unhook the top of the spring, bend it to increase tension then reset it in the slot in the repetition lever and then gently reduce tension until it is where you want it to be. Oh well.. The bottom example shows an attempt to introduce screw adjustment to the Herz spring but that design never achieved much traction. Here is a great site to learn more about piano and action components.